Ron George: The Ticket to the Races : Biological Passports, How Good? The Ticket to the Races : Biological Passports, How Good? Before I start, I'd like to mention that the results of some wheel tests done on a bunch of new hoops are over at Roues Artisanales for 2008. As always, I'm excited to see new tests done on racing products. This test in particular addresses aerodynamics, inertia, lateral stiffness and bearing resistance of wheels in a 5 part series (of which only part 1 is available today as I type this). Interestingly, some of the latest models of Mavic seem to be on the higher end of aerodynamic inefficiencies. While NASA is testing the LRO for the upcoming moon mission and President Bush remarks there should be world peace at whatever the oil price, UCI is on a race to implement biological passports for riders. We are told that its introduction has been successful beginning this year.In my understanding, they brought this idea up last year after doping controversies were just flooding the reputation of international cycling and all that called for a solution to tackle the problem lest the whole sport gets corrupted. What the passport is its a data collection method (probably electronic) by which testing agencies (WADA certified, contracted by the UCI, how else on earth are they going to test 7000+ riders for a total of 8000 tests?) collect blood hematological and urine samples of a rider (which should stay constant over time) and really see how these values evolve over the year. Test samples will be taken on and off the season, during some critical points, such as a few weeks before an international stage race. Paid analysts looking at all this will then judge whether the profiles tell a true story or if someone is throwing mud in their eyes by faking all that oxygen carrying capacity. I think cycling is the first to do this in the sporting scene. It isn't very innovative, I mean the concept seems like a no brainier. But the process logistics are the difficult part and its the UCI, oh well, so keep your fingers crossed. They better do a good job of it since its likely other sporting bodies are looking at the same and seeing if it'll work for cycling so they can implement it in some fashion. Along with urine and blood samples will also come a steroid profile (for instance, what does that unbranded 'asthma relief inhaler' really contain, when did XYZ rider take it and so on) . Whats more, riders will also have to be transparent about their whereabouts during testing. All this information is going to be stored in their 'passport'. No clean passport, no racing. I feel everything should be done to keep the sport clean. Otherwise, millions of us paying to watch races and cheering for our riders are just wasting time and money, and a genuine passion for bicycling as an avenue for sport and fitness will be shrouded by implications that it is corrupt because there's the smell of drugs everywhere in it. However, the passport system seems just a little too privy to me. The tough training, myriad wind tunnel and lab tests, media following, controversies and now the biological profile testing system must be really putting a lot of pressure on riders. Will this be a factor in distracting them off what they should be really doing in office? The fact that many of the riders are being invaded like this due some other reckless folks in their own team and peleton must be pretty stressful to them and their families. Also, with the above mentioned pressures, and the fact that drugs will be cleansed off the scene, I'm wondering whether they'll ever ride the same again? Will races post 2008 be a stark contrast to the ones of yesteryears, where every second brought with it excitement and the classic battles and struggles on the mountains of France and Italy are deeply embedded in our memories, even today? On the other hand, I think UCI has struck a right note with this one if they do a good job of it. I hope that the information in the passports remain secure and is not hacked or leaked out. The proper handling of confidential information is important and only authorized people should handle it provided they have some sort of licensed agreement. I don't really know how these passports work. But my suggestion would be to round up a group of suspect riders and keep them under 'probation', if you will. 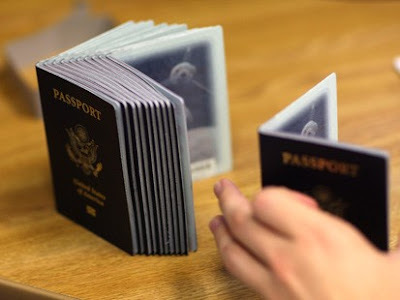 At the same time, passports have to be renewed every year. So after a threshold amount of time, if there's a rider (say John) who has a clean record and continues to do so, the excessive amount of tests and other burdens should be stopped as a way of rewarding John for his honest efforts towards the sport. Isn't that motivating? Now if John starts using drugs after this period, I would question the kind of moral character he really has... this guy is really the scum of the earth isn't he? And I don't think any rider in the peleton is immature enough to be on this extreme. I think I keep riders in high regard that way. So true... It will be interesting to see how the 2008 peloton looks. I still say it's a huge effort but that's what it will take to keep the sport clean and true. There will still be someone who works to beat the system... to counterfeit... to cheat. If there's big money involved... unfortunately there are those who will always look for other means to achieve a peak performance.